My husband's family is a family that sings... a lot. They take tunes that they know and change the words to fit the situation. It can really be quite funny - either the lyrics themselves... or just how bad the song gets butchered. It's one of those that are you are either laughing with them or at them, but either way, we are laughing. My son just recently started singing songs and remembering them. It has been a slow progression since he was about 2 1/2 years old, but I noticed the other day that he really does know most of the lyrics of songs now! Of course, he's singing: Twinkle Twinkle Little Star, Jesus Loves Me, Baby Beluga, Row Row Row Your Boat, etc. These are not top 10 hits (except for in our mini-van). One of his favorite songs in the Spiderman theme song (the original, from the 1960s). That one always cracks me up. Have you ever thought something was a GREAT idea, thought it was terrible while you were doing it, but afterwards realized that it wasn't so bad and you may repeat it? Well, that happened with our first trip to the Library, but now it is a weekly occurrence. We can't make the preschool story time because it conflicts with my daughter's nap. So, I decided that we should take a trip down to the library. I figured it would be better to ride my bike and let the kids sit in the bike trailer. I wanted them to be able to have time to look at things in their world and for us to be able to discuss them. (I'm always looking for ways to incorporate language learning in our everyday lives.) Well, the entire way there the kids fought in the bike trailer. However, Timothy did learn the word "antagonize" - so at least we had some language learning. By the time we got the library, I was hot and aggravated. I put on a smile and told the kids that we were going to get books! Timothy was very excited. Joanna was not so eager. When we got in there, Timothy ran from book shelf to book shelf looking for any train or car on the cover of a book saying, "oh! I like this book!" Joanna, on the other hand, just pulled every DVD they owned and put it on the floor. I wasn't able to help Timothy because I was scurrying to pick up the movies and put them back. Joanna didn't really get much out of this whole experience (or so I thought). The image that I had in my head of me helping Timothy and Joanna find books, sitting on the big bean bag chairs, reading them books and laughing was definitely NOT what happened. We left with our books, we made it back to the house with both children intact (maybe a few scratches from fighting), but then an amazing thing happened. They both went to the library bag, picked out a book, sat on the couch together (without fighting) and read their books! What's even more amazing is that they ask to go back every time we drive by the library. Even my one year old points to the building and starts laughing and getting excited saying "book!" Sometimes language learning doesn't look good, it isn't easy, but it's definitely worth it. With that said, I've realized that I was putting so much pressure on the blog. I wanted to make sure to blog 3-5 times a week and when I couldn't hit that, I was disappointed. I have realized that it's ok to blog just 2-3 times per week. No one has time to read my blog every single day anyway!! So, I'm starting off with some Halloween throw-backs. Click here for a great free printable Halloween idea. Can you believe that it's already close to Halloween? Also, check out my TeachersPayTeachers site for more Halloween materials. There's even another free one on there! Timothy learned to walk backwards before he has learned to count backwards. I'm sure you're thinking "yeah... that's pretty normal." Well, yesterday I used his ability to walk backwards to help teach him to count backwards. All I needed was some sidewalk chalk (20 pieces for $1 at the Dollar Tree) and our feet (well and my phone to capture this video). This was the second time he had done it. He had so much fun that we did it a few times and then he started trying to hop backwards! Remember that learning can happen anytime and doesn't require a lot of expensive materials! Has it really been two weeks? That's what happens when I get out of my routine. Timothy discovered a Thomas app on the ipad. He is obsessed with Thomas the train. One of the games on the app is a matching game. He quickly figured out how to play the matching game. 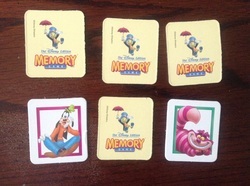 He was able to navigate the game by touching the cards and would get excited when he found a match. If he found Toby (for instance) and he had already seen Toby somewhere else, he would immediately touch the correct card and say "TWO TOBYS"!! Here's where the mistake comes in. I thought he had learned how to play a matching game. He had not. He also didn't know what same, different, or match meant. Me: Are those the same? Me: That's Nemo and this is Thumper. Are they the same or different? Me: No, Nemo and Thumper are different. There was no fight. There was no tantrum (from him at least ... I was kicking myself for being so foolish). We simply turned over the cards and I proceeded to play the game teaching him about same, different, and match. It just shows you that technology can only bring you so far. One-on-one teaching with your child can't be replaced by a computer, tv, ipad, DS, etc. Now, do I think Timothy would go to college not understanding same, different, and match? No. However, I'm glad to catch it early and to be the one to teach him. Ever since teaching Timothy (age 2) about St. Patrick's Day and the different vocabulary that accompanies St. Patrick's Day, he has been obsessed with rainbows. Even when eating pretzels, he nibbled on it until he made some semblance of an arch and exclaimed, "Mommy rainbow!" It's really quite cute (or "tute" as he would say). It got me thinking about colors and how to best teach them. Timothy picked up on his colors rather quickly, but not every kid does. If your child is having a hard time learning his colors, then try this technique. Pick ONE COLOR and focus on that ONE COLOR for a set number of days. You will know your child best. If you want to change the color each day, do that. If you want to have one color each week, do that. However, focus on that one color. You don't want to ignore the other colors, but really only be teaching that one color. So, set a location in the house where you will display what color it is that day/week. Get excited and your child will get excited too! Put a piece of construction paper in that location to show the color of the day/week. You can even write the word out on the construction paper so you are adding print with what your child hears. Have them pick something out to wear that has that color (if this is too hard, then you choose two shirts and see if your child can find the one that matches the color of the day/week). Have your child eat a snack that is that color (red = strawberries, orange = goldfish, etc). Any worksheets or learning activities can be completed with a crayon, marker, or colored pencil that is the color of the week (so much more fun than using a pencil). When you are running errands, then point out things that you see that are the color of the day/week. When reading books, then point out things in the pictures that are the color of the day/week. When you focus on that one color, then your child won't get overwhelmed with ALL the colors that they see in a day. If they call the yellow truck a blue truck, then correct them sweetly and say, "Oh I see that truck. It's yellow. I like that color", but move on don't get hung up. We are only expecting them to learn ONE COLOR at a time. Also, don't be surprised if your child doesn't learn the color in a week. That is ok. Just cycle it through in a few weeks so that they get another go-round of that color. Also, we don't expect children to know their colors until age 3. If your child is younger than 3 and is starting to recognize colors, then he/she is ahead of the game. If your child is 3 and it's just starting to emerge then he/she is on-track. If your child is 4 or older, then you will want to make sure to focus on teaching them colors (but don't panic, either). If you are ever worried about your child's language progress, then always double check by asking your pediatrician or getting a speech therapy evaluation. Here is a St. Patrick's Day book from last year! It's a great little book to get kids involved with St. Patrick's Day!! Click here to see the blog post and download the pdf file! I quickly created this little St. Patrick's Day sign to help teach kids some of the vocabulary that centers around Irish Folklore and St. Patrick's Day. I have some other games and books on my teachers pay teachers store. A sale is going on now, so check it out! St. Patrick's Day is not the easiest holiday to teach about. However, there is LOTS of new vocabulary that you can teach! How many times a year do you really talk about shamrocks and leprechauns? In my mind, there are two main things to teach about St. Patrick's Day - the secular version and the religious version. You may want to pick one over the other or both. I focus on the religious version, but I also teach the secular version so that my kids understand all aspects of the holiday. The religious version. Do you even know who St. Patrick was? A wikipedia search will give you some good information. However, the short version is that St. Patrick was a British man who went to Ireland to teach the Irish people about God. He used the clover (the 3-leaf version) to teach them about the trinity. When teaching this version you can show pictures of St. Patrick, a map of where England and Ireland are, and teach how the clover can depict the trinity (and who the trinity consists of). The secular version. St. Patrick's Day is a day to celebrate Irish culture. The things surrounding St. Patrick's Day are also symbols of Ireland. Green is the color that we wear. Shamrocks (or clovers) are often found in Ireland. A leprechaun is a man who is part of Irish folklore. He is typically dressed in green and likes to make mischief. You can also teach about rainbows and the pot of gold at the end. Either way, have fun with St. Patrick's Day!! 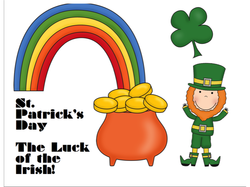 Check back for some fun St. Patrick's Day learning activities! Click here for the pdf version of the Journal Entry. If you are just joining us, then make sure to read Tuesday's blog about counting down using a paper chain and Wednesday's blog about how to create a journal using the paper chain. Hope you enjoy counting down and creating a journal keepsake! Now, that we have discussed creating a paper chain and ways you can make it a learning tool, let's take it one step further and make it a language-learning/writing activity! Have your child write about how he/she is feeling about the activity or special day. If your child is not writing, have him/her circle a happy face that is showing the correct emotion or tell you about it and you write it down. 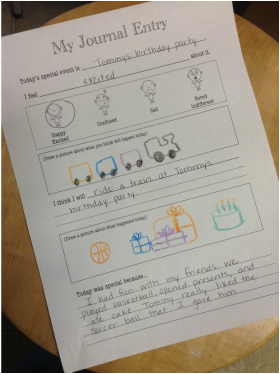 Have your child write about what he/she thinks will happen that day. Again, the journal "entry" can be a drawing, a drawing plus a few written words (either by you or your child), a sentence, or a paragraph. I know that sometimes the events occur in the morning or the morning can be taken up with having to get ready. Therefore, this activity may be best to do the day or night before. For those of you who have children who are working on pragmatics or who have Autism Spectrum Disorder, this can be a great activity! It can help you understand how your child is feeling about something that's coming up, it helps give your child the language to talk about how he/she is feeling, and is another method in trying to get your child to process the change or event that will occur. Have fun with your journal entries. You can re-read them in order to talk about all the fun things you have done. It will also make a great keepsake!